This post was submitted by guest author John Salak for CIMSEC’s Distributed Lethality week. Distributed Lethality is a concept that offers the Navy an opportunity to transform our force structure to both enhance and expand mission capabilities to meet our national military objectives. It takes our contemporary carrier-strike group model centered around the striking power of the carrier – and re-distributes that offensive power across an up-armed fleet, and across the battlefield in distributed SAGs. Transforming that concept into reality may call for a little out-of-the-box thinking on how the Navy can achieve a larger footprint that is both scalable to a conflict and adaptable to a variety of missions. Better yet, in an era of significant budget constraints, it would be achieving those capabilities by utilizing existing technologies and assets in platforms, weapons, communications, and sensors in a new combinations that significantly transform tactical employment. One of those out-of-the-box ideas started out as a way of indirectly enhancing LCS mission capability by utilizing off-board systems to increase the defensive and offensive perimeter with remote weapons platforms. Cooperative Engagement Capability (CEC), a foundation block for distributed lethality, is one of those key technologies for extending the reach of LCS off-board defensive and offensive weapons. Utilizing off-board weapons platforms at a significant distance from the ship effectively buys time in the kill chain for early engagements in a defensive mode, and quicker strike in an offensive mode. As an example, selection of the Vertical Launch capable Hellfire Longbow for LCS opened up the potential to outfit smaller off-board craft with the same weapon and forward deploy those craft to extend the LCS weapons radius. Another foundation block of distributed lethality, the battle space sensor network, eliminates the need for local sensor capabilities on the off-board platform to develop threat and targeting data. CEC provides the communications mechanism to integrate the off-board weapons and fire control with C2 assets to select and engage with the appropriate asset. While the idea was initially applied to enhancing LCS capability, the same concept and capability can be extended to any Navy capital ship with the C2 assets to control an engagement. The LCS is a pretty fast ship, so off-board weapons platforms have to be not only as fast, but preferably much faster in order to maintain that extended footprint as the LCS force maneuvers. Helicopters (manned or unmanned) are the obvious answer, but they come with their own set of limitations for payload capability, time on-station, and a host of other resource limitations. So what is the best solution for this high speed, large payload, and high endurance off-board craft? 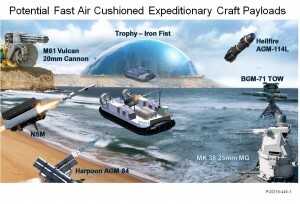 If we look at the Navy’s LCAC hovercraft/air cushion vehicle (ACV), the answer to this providing this new, unique capability becomes apparent. The LCAC is designed to carry payloads up to 70 tons at design speed. Like any ship or aircraft, high speed and high payload usually require significant amounts of propulsion power. In the case of LCAC, what if that power was diverted from payload capacity to increased speed with the end result being a craft capable of near helicopter speeds with 10 times the weapons payload of a helicopter and 4 to 5 times the mission endurance? We call this modified craft the Fast Air Cushion Expeditionary Craft (FACEC), with a speed capability in the 85-100 knot range and weapon payloads up to 35-45 tons. This high speed craft would use its open cargo deck to provide the capability for utilizing reconfigurable strap-down modular weapons loads, much like an aircraft, matched to specific mission needs. While the skeptics maybe already firing up their keyboards to mention the problems with Patrol Hydrofoils (PHM) and numerous other past attempts at very high speed naval craft, this is a varied approach. The key difference in this case, and why LCAC has been successful, is the craft was not designed as a ship, it was designed as an aircraft that flies 3m above the water. With all ship based designs, one literally brings along the kitchen sink as part of the weight/speed/power trade, and that has consequences in mission endurance/range, speed, and weapons payloads. With LCAC the kitchen sink, along with everything else not essential to mission performance, gets left behind to the benefit of speed, payload and endurance. The trade is LCAC requires a host carrier ship for long range transport, crew accommodations, maintenance, fuel, and weapons. The FACEC conversion of an LCAC would be optimized for high speed by significantly reducing that 70 ton payload capability to a range sufficient for any weapons modules that would fit on the deck. The envisioned weapon payload modules, such as a 24 cell LCS VL-Hellfire, 4 cell Naval Strike Missiles, Harpoon, APKWS, and even MK-41 VLS modules can be combined or swapped out to meet specific mission tasking. Layered weapons capabilities would include remote control guns and self-defense systems. The ability to shoot from the LCAC platform has been demonstrated in the past with efforts such as the GAU-5 based Gun Ship Air Cushion and rocket launched systems such as DET/SABER and the MK-58 lane clearance system. The utilization of a very high-speed air cushion craft as forward deployed weapons platform/picket in a CEC network provides some interesting engagement scenarios for an opposing force. The speed capability makes rapid deployment and maneuver 50 to 100 miles forward of the main force a practical reality. The off-board weapons capability cannot be ignored in any attempt to engage the main force if the FACEC are deployed in sufficient numbers. The opposing force must either concentrate on taking out small, relatively low value assets or risk being attacked or neutralized by those same assets if they engage the main force directly. Being an ACV, the FACEC is not restricted by any shallow water maneuvers, which opens up large operating areas that make the A2AD much more difficult for opposing forces. The speed and maneuver capability of FACEC would make it nearly impossible for any surface based vessel like a corvette or fast patrol boat to outrun or hide in an engagement. Being an ACV, the FACEC could hide anywhere there is enough space to park it, including on land, for fire and evade scenarios. In areas of the world where restricted maneuverability is a constraint, FACEC enables the weapons systems to venture into those areas while safely leaving the command ship behind. Need an AEGIS ashore battery? Send a FACEC loaded with a pod of SM-x equipped MK-41 VLS on an erectable base and park it anywhere you have a clearing. Running a mission against a large force of small craft? 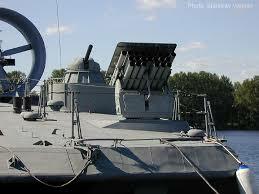 Send a FACEC with 48 VL Hellfire Longbows and a remote control 25mm gun. Need something to reach and touch the enemy at 100 miles? Send a FACEC with NSMs and/or Harpoons. The astute observer might be wondering about that host ship carrier mentioned earlier. The USMC is already looking for more lift capability and more Lxx type host ships that carry LCAC are not in budget. 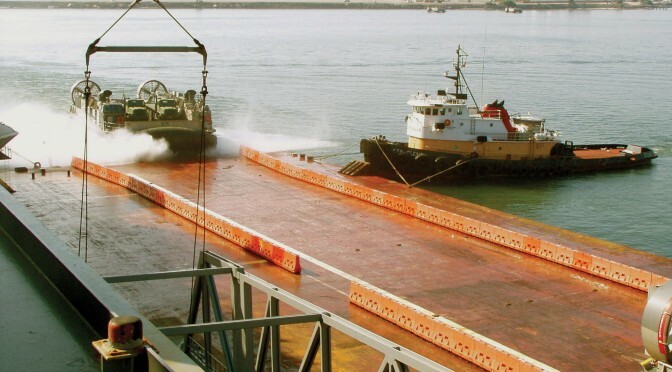 The additional lift problem is addressed by utilizing a type of commercial off-shore platform support vessel capable of ballasting down to launch and recover the FACEC craft. A 105m craft has been identified that would be an ideal support platform for two embarked FACEC, while providing crew accommodations, maintenance, fueling and most importantly the ability to store and swap out the modular weapon systems. The ballast down capability allows FACEC operations similar to those currently conducted by LCAC and MLP ships. There are also potential alternate missions once the FACEC are launched, such as USMC AAV transport in support of expeditionary operations. In an era of shipbuilding budget pressures, these commercial PSVs are envisioned as another component of the MPS force, and eventual resale as commercial ships once their mission need ends. The FACEC/PSV combination makes a great hunter/killer combination with quick reaction capability. With the commencement of LCAC-100 production, the U.S. Navy will have eventually have a significant fleet of legacy LCAC available for FACEC conversion. By utilizing existing assets and modifying them for high speed operations, adding CEC comms, along with repackaging some existing weapons to make modular swap outs possible, the Navy has an opportunity to transform force utilization in the littorals. If you want distributed lethality at its best, here is your express pass to get it. Mr. Salak is employed by BAE Systems. His background includes 28 years of LCAC engineering support, development of LCS off-board systems for mine warfare, C4N systems for the ONR T-Craft, and 12 years as a USN P-3 crew member.